It’s not your fault, really. It happens to all of us. 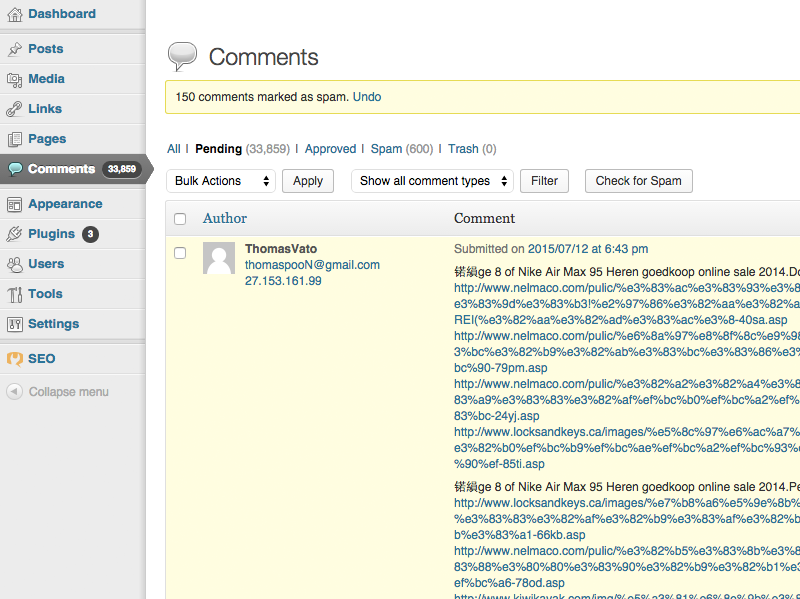 Comment spam is a pervasive problem in the modern web, and CMS systems like WordPress are especially susceptible, since so many people use them. For some reason, so-called “SEO Experts,” usually from overseas, are sending tons of comment spam out to websites in hopes that the URLs linked from their comments will somehow pass link juice back to their client’s sites. In reality most search engines like Google don’t count links in comments as passing any domain authority, or link juice, onto other sites, so these spambots are completely pointless and paramount to an utter annoyance for webmasters and agencies. Enter Akismet. It’s one of the best spam-prevention tools on the market and will keep all those dizzying spam comments away from your delicate eyes. We install Akismet on all client sites by default and if you are hosted with us, we’ll even configure a commercial license for you. And occasionally, as in the case of our client’s site pictured above, we’ll even save you the 4+ hours of painstaking effort it would take you to go through and manually delete 35k+ spam comments, and automate it for you. Aren’t you glad you have a web design agency on your side…?